Learn to teach, teach to learn. Are you ready to share your love of yoga with the world? Join us in an exclusive yoga teacher training at Baltimore Hot Yoga & Wellness. Over five exciting and life-changing months, you’ll learn to teach yoga in our diverse and welcoming community. We believe that the best teacher teaching prepares you to teach for life. Our mission as a yoga school is to develop teachers who have the depth of knowledge to teach whichever styles of yoga interest them most, knowing that a teacher’s interests will deepen and grow over time. Lauren Flax, RYT-500, teacher, healer, and reiki. We are dedicated to shaping the best teachers, rather than the most teachers. 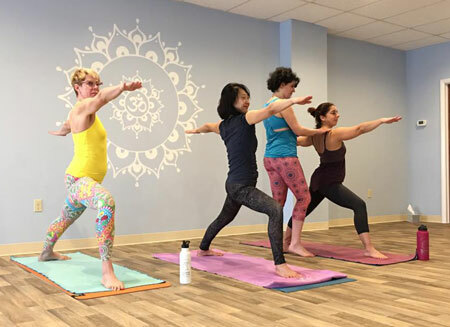 In an intimate and highly focused environment, you’ll learn to teach the yoga that moves you, whether that is an invigorating hot vinyasa class, a meditative restorative class, or any style in between. The smaller size of our teacher training means that you’ll receive one-on-one attention to hone your skills, as well as opportunities to teach real, full length classes and develop your style before you step out into world of teaching. Our training is comprehensive. During these five months, you will explore teaching different styles of yoga. If you have a strong interest in a particular style of yoga, you may choose to focus on that style in depth during the second half of the training. Upon completion of our program, you’ll be ready to teach the yoga that moves you. We believe that the best teachers bring both an intellectual and experiential, embodied understanding of the yoga practice to their students. This training is limited to 10 dedicated students. Sign up now, space is limited. BHYW teacher training is the best of all worlds: an intimate environment focused on YOU and a convenient weekend schedule. Please note: all trainees will be expected to complete an application prior to the start of training. $3,500 paid in full, prior to the start of training. $3,200 if paid in full by June 1, 2018. $500 non-refundable deposit (in studio only). Please contact the studio for information about payment plans. Deposits and payment plans may be processed in studio only. A reading list will be supplied prior to the start of the training. Students will be responsible for obtaining the items on the list. Those enrolled in the teacher training may practice at no cost at BHYW for the duration of the training. Refund Policy: $500 non-refundable deposit, remaining funds will be refunded ONLY if Baltimore Hot Yoga & Wellness is notified of cancellation within 30 days of commencement of training. No refunds will be issued after training has started. * Those interested in teaching the 26&2 will be expected to learn our dialogue prior to the start of training. ** As part of your training, you will teach classes in our studio to gain real world experience. Please note that completion of the program does not guarantee teaching opportunities beyond the training. Training times are 6:00-10:00 p.m. Fridays, 9:00-5:00 Saturdays and Sundays. Attendance is mandatory for all sessions. Sessions missed due to emergencies may be made-up during the next training. Registration for the next Teacher Training opens in early 2019. The Fall 2018 training is in session!